I may not know where to get decent Chinese food in this town, but now I know where to buy my crack: down near the corner of Cermak & State, where a very polite man offered me some as I waited at a red light around midnight. Back in June i got some mesclun at the farmer's market, and this curly little wonder was part of it. The merchant couldn't tell me what it was, because they got it from someone else who kept his components a trade secret. 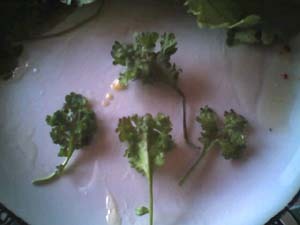 It's delicious, a bit tangy, a bit spicy, curly and dark green with markings of dark reddish color. Anybody know what it is? I just read an article in a recent issue of Conde Nast Traveler (which arrives at my house for the roommate) in which someone had written an article bemoaning the sorry state of airport food. They went to airports all over the world and really didn't find anything worth eating. And I have to agree with that assessment in general -- airport food is beyond appalling and I have on occasion walked through entire terminals in the hopes of something decent to eat, only to settle for Chili's -- but disagree in specific. I can think of three places I have had damned fine airport eats. One is the international terminal in Boston's Logan airport, where there is a foofy high-end place that cobbles together dishes from several of Boston's celebrity chefs. Littlelee and I had a shockingly good meal there before our flight to Germany, consisting of smoked mussels in a mustard sauce and a top-notch lobster bisque. Expensive, but what do you expect in an airport? Another is the Memphis airport, which was touched on by the article as having sad-sack BBQ, so perhaps I am confusing it with another airport (Nashville? Dallas? ), but I distinctly remember getting BBQ in an airport that was entirely acceptable. And last is the crown jewel of airport eats, combining unquestionable deliciousness with speed and affordability. Its only flaw is that, to my knowledge, it is not available in any US airport. Anyone who's flown through Heathrow should know by now that I am talking about Prêt À Manger. Dear merciful heaven, what a great idea. Fresh healthy organic ingredients, frequent preparation of sandwiches and salads, straightforward but interesting flavors, and streamlined presentation -- you can scoot in there and within 5 minutes come out with a fantastic non-soggy rock-shrimp & arugula sandwich, a packet of all natural black pepper potato chips, and an organic elderberry soda (my new favorite soda, yum). 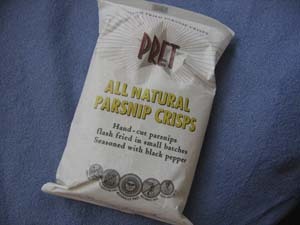 The parsnip chips pictured above are my last treasure from our multiple trips to Prêt À Manger during our euro-voyage, and they are really wonderful, sweet parsnippy flavor balanced with a good hit of black pepper. Why O why can't we have such a thing on our own shores, especially in this day and age of reduced or eliminated airplane meals? Sigh. so i have this client out in Addison, IL, and sometimes I end up being out there right around lunchtime, like I did today. And today, happily, I had arrived early to my meeting and gone to the nearby mall to buy thread before heading over to the client, and while I was there I saw a little sign reading "Polish Deli." Now of course you know that's like a freaking homing beacon for me, so when the meeting ended at noon, I went straight to the deli, hoping for a decent sandwich at least. But they have also got a hot-food bar, and you can buy a "hot lunch" for $4.89. This consists of a meat, mashed potatoes (or you can swap in sauerkraut as I did), and a salad (this being one of those russian-style mayo salads in the cold case). You could choose pork in mushroom gravy, pork or chicken cutlets, ribs in gravy, galumpkes, and a few other things for your meat -- i chose the pork in mushroom gravy, and the carrot-horseradish salad. I worried it might be pasty steam-table blandness, but this stuff turned out to be great! 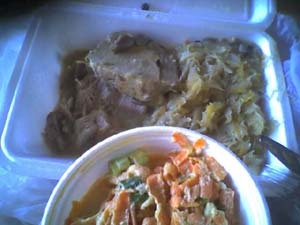 The meat is tender and flavorful and moist, the light creamy gravy is super tasty, the kraut is nice and the horseradish in the salad is strong and fresh. A hidden gem, although not so hidden to the Polish population -- the place was jammed with people and the only person getting English from the staff was me. Let's hope for more lunch-time trips to Addison, heh. I got some peaches at the lincoln park farmer's market this weekend that were just dreamy. I was dithering over yellow or white but the nice boy at the stand said the whites were his fave, and gave me a taste when i seemed skeptical. 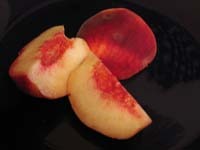 White peaches are usually sweet but flavorless, in my experience. These were stupendous, though, so i bought some. Along with a couple yellows just to compare, and a box of yummy end-of-season blueberries. All of which i have been eating for breakfast all week long -- yahoo! I love summer stone fruits, oh yeah, mmm, mmm, let me sing my fruity song of joy, la la. Whee! 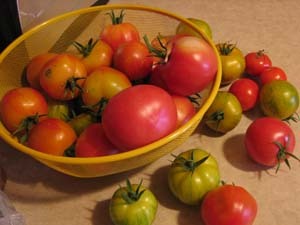 The plants I half-assedly put into the dirt along the backyard chainlink fence have borne fruit, and I have a big bowl full of Green Zebra and miscellaneous red tomatoes. Tomato & mozzarella salad for lunch tomorrow, oh yeah! Tallasiandude is here for a visit, and I'm still on the quest to find an acceptable chinese restaurant, specifically a shanghainese restaurant. 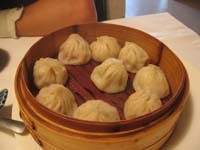 Ed's Potsticker House was reputed on LTHForum to have great soup dumplings, and some of the other dishes got raves as well, so we headed down there for lunch today. We had the soup dumplings, the house cigar-shaped potstickers, some pork belly in garlic sauce, and sauteed rice cakes with bok choy & mushrooms & pork. All of it was decent, some of it was good, but none of it lived up to the raves, and none of it was spectacular. I am beginning to despair of the potential of finding chinese here as good as the stuff in Boston, New York or California. It makes me a little distrustful of the LTH reviews, but i have to remember to account for the fact that people usually only really know the eats in their own town, and can only make comparisons with what they know. I had no idea how good Boston chinese could get until I met tallasiandude, and he took me so much further past what I knew as "good" in Chinatown. 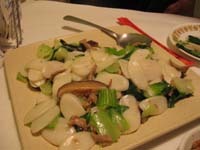 The rice cakes were pretty good, nice flavor in the bok choy, and the soup dumplings were fine but not as good as Wing's in Boston. The cigar potstickers had an odd sweet, almost cinnamony flavor in the meat, and the wrappers tasted like wonton wrappers -- i thought they were ok, tallasiandude was not a fan. The pork belly was nice, meaty & fatty with a sort of black bean-garlic lightly spicy sauce; we quite enjoyed it, especially with a bit of white rice. So yeah, a decent feed but not what we've grown accustomed to, alas. so we waded through the clots of hipsters outside The Bongo Room (at 10am on Saturday! don't these people have hangovers to sleep off??) and got some brunch. Eggs benedict, to be specific, one with lobster and the other with canadian bacon. First of all, they actually poached my eggs hard, the way I asked them to -- i was thrilled. NO ONE ever actually sends me hard-poached eggs in my benedicts, and so my hollandaise gets diluted by the runny yolks. Eeew. It was very nice, but the lobster version was lacking in salt, easily remedied with a quick go with the shaker. Their "hash browns" are really home fries, but they are exceptionally good, some of the best I've had, very flavorful and moist, yet with a crunchy exterior. They also have some cool-looking mimosas and bellinis, though we didn't indulge. One thing I thought was weird, though, is that the decor was surprisingly boring except for the crazy spinning steel ceiling fans. Eh. I had a little bit of one this morning at work, leftover from a training breakfast, and it was pretty mediocre: pasty and yeasty and dry, not nearly enough cinna-goop or glazing. They have cinnamon buns on their boxes as their logo, so they must be renowned for them, but I can't see why. I didn't even bother to finish eating the half-bun I took. Bleh. I've had way better, most recently at an Amish bake stand in the Reading Terminal Market in Philly. Based vaguely on the puffy corn omelet in Gourmet this month, except that i can't be bothered to separate and beat the eggs, so my omelet ain't puffy. But it sure is tasty. Preheat oven to 350F. Melt the butter in an ovenproof skillet. Leave the heat around medium and cut and scrape the corn from the cobs into the skillet & stir to break up. 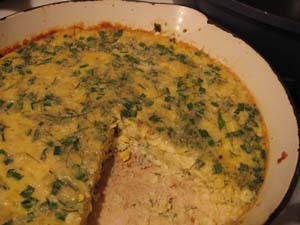 Before it all gets absorbed, pour in the eggs and add the herbs, and stir the whole works to distribute evenly. Bung it in the oven for 20-30 minutes or until the middle is all cooked solid. Cool in the pan and then cut into wedges to serve hot, cold or room temperature. 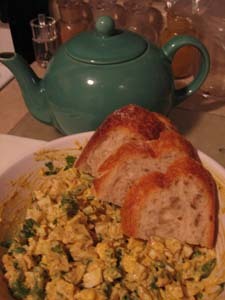 I read a recipe for curried egg salad somewhere recently that sounded good, but i couldn't lay my hand on it when it turned out there was no protein in the house save 8 eggs, so I winged it and came up a winner. Mix all this together. Serve with toasted slices of sourdough bread and a sliced tomato salad. Serves 3-4 depending on hunger. 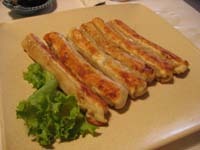 Makes a very nice lunch or cold summer dinner, especially if made ahead and kept in the fridge. How cute was the winner of Hell's Kitchen? Adorable, adorable, adorable, and clearly the best of the lot. I want to eat in his restaurant. Pan grilled a bison steak and managed to get it just perfectly medium rare with a nice crispy crust. Delish. Made a fennel-cabbage slaw based on one in Gourmet magazine, and took some leftover yukon golds in mustard vinaigrette and put the rest of the chimichurri into it to make tangy herbed smashed potatoes. Woo, baby - yum! Mix 2 big spoonfuls of mayo with a couple tablespoons sherry vinegar & a bit of salt to combine, squeeze half a lemon and grind a bunch of black pepper over the veggies, and stir it all to combine. Let it sit in the fridge a while to blend flavors. Crisp, refreshing, clean, and tangy -- very nice indeed.